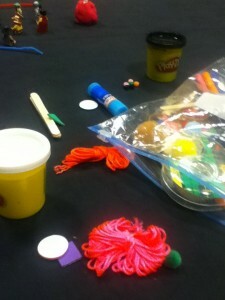 I was in a cool workshop today with Chad Sansing and Andrea Zellner about remixing, play, and creativity. At the start of the workshop, each group was given a bag of random materials (legos, pipe cleaners, playdoh, tape, beads, etc.) that we were to remix to create a story. This was a prelude to a discussion about openness and agency in a make/hack/play context. This made me think about a couple activities that might be used to launch our online maker space. Here is one. Hack a digital story – Here you’ll find a collection of digital parts (characters, photos, music clips, settings, etc.). Make a story from it. Here’s an example of one that you can do. Have fun, and let me know what you think. Also, feel free to create your own remixable story set.